Nicholas Woods, student of Eastern Michigan University graduating December 2018 with a business degree in marketing. 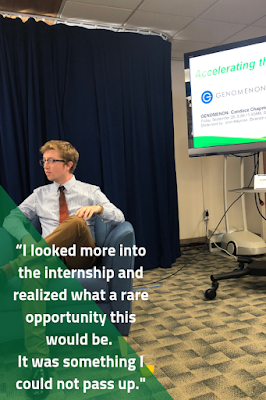 While in the Digital Summer Clinic with Center for Digital Engagement, Nick was a marketing intern with Genomenon, Inc.
About Genomenon: Ann Arbor based company developed from the University of Michigan by Dr. Mark Kiel. This is the world’s first (and best) genetic search engine, where you can type in any disease/gene/variant and get the most clinically relevant articles and literature of what you are researching. Nick was a student of Bud Gibson at EMU and learned about the internship opportunity. “I looked more into the internship and realized what a rare opportunity this would be. It was something I could not pass up." As an intern for the marketing department at Genomenon, Nick developed their Google AdWords and ran their analytics campaign. This experience taught Nick to never be afraid to ask questions. "I was always bad at this, even in college," Nick learned that not only will you receive the correct answers from experts in the field, but you also develop personal relationships with coworkers. Everyone at Genomenon is passionate about what they do and will always make time to answer questions. “Being a startup, I was constantly thrown new challenges and given small projects to work on. I stayed very busy." 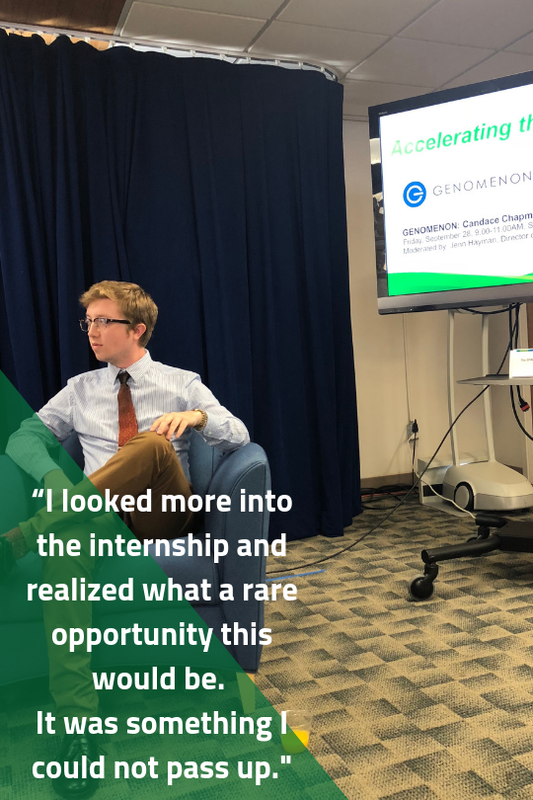 During the summer internship, Nick was offered a full-time position with Genomenon. Once graduating from the CDE summer clinic, they assigned him a desk and gave him business cards! Nicks new title became, Marketing Coordinator. "It happened very fast but I’m extremely lucky to be here. I know if it wasn’t for CDE getting my foot in the door, my chances of working here would have been slim to none." Nick designs and send the emails for Genomenon. He is also in charge of Google AdWords and Analytics, as well as talking to vendors or PR professionals. Skills Nick has developed has come from attend some client meetings/lunches, picking up various business habits that are key to successful meetings. "Working at a startup, you tend to wear multiple hats "
At times, Nick will bring work home or work off the clock, "turning in quality work is the best confidence builder," If you put in the time and worked hard, your superiors will be pleased. If Nick feels hesitant about showing off a new project or design, he will go back to the drawing board and tackle the problem from a different angle.